This week, The Cleveland Orchestra and Music Director Franz Welser-Möst embark on their nineteenth international tour together, giving eleven performances in seven cities across mainland China and Taiwan. As well as debut performances in Macao, Shenzhen, Wuhan and Nanjing, the orchestra returns to audiences in Taipei, Shanghai and Beijing. Though the orchestra and Franz Welser-Möst have previously performed in Asia several times together, this tour marks their first joint appearances in China. The tour features two programmes which spotlight four major musical works: Beethoven’s Emperor Concerto with soloist Daniil Trifonov alongside Richard Strauss’ Ein Heldenleben, and Tchaikovsky Symphony No. 5 with Prokofiev Symphony No. 3. 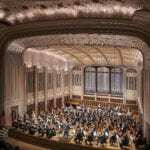 Under the leadership of Music Director Franz Welser-Möst, The Cleveland Orchestra has become one of the most sought-after performing ensembles in the worlds. It is a great privilege to be working with the orchestra for the first time on this tour to China. View the full schedule here, and follow the orchestra’s journey on tour via its tour blog.